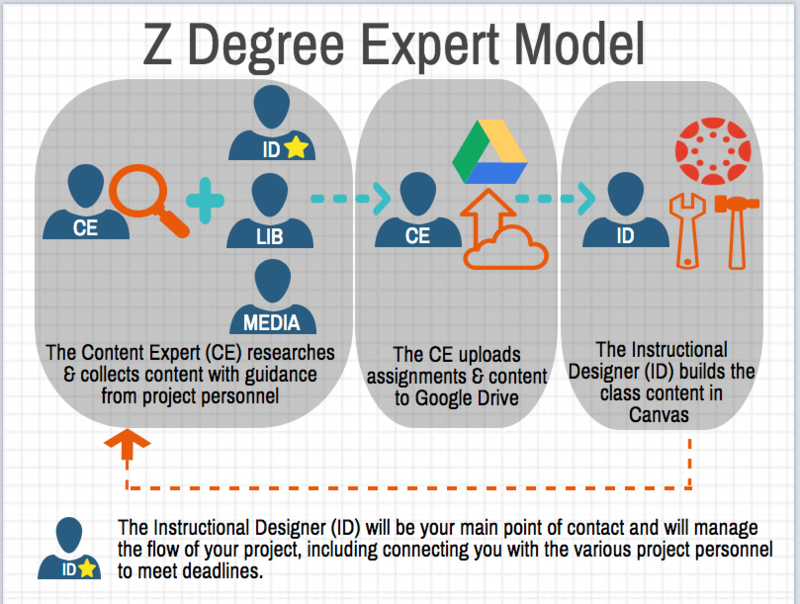 What is a Z Degree? The Z Degree or “Zero-Textbook-Cost Degree” is exactly what it sounds like — Students are able to complete an Associates degree from MCC without paying for textbooks. The classes included in this degree leverage Open Educational Resources, library databases, and faculty-developed content to forgo the need to require expensive textbooks and publisher materials. Currently, we are only funding the development of online courses; however, if the content that is curated/developed is used in another modality, the course can be can be labeled a Z Course. Whether you are already teaching a class without a textbook or you’re interested in dumping your textbook to curate/create your own content, we would like to include you in our efforts. The easiest way to determine “where you fit” in our Z Degree efforts is to contact Laura Ballard, eLearning Director: laura.ballard@mesacc.edu. Or you can read on to learn more about the program. We are currently funding courses that are already taught online and contribute to the Arizona General Education Curriculum (AGEC). We will begin advertising for the AGEC Z Degree pathway beginning in Spring 2019. We hope to have the ABUS Pathway completely developed by the end of Fall 2019. Preview some of our completed courses on the MCC Online Course Previews page. Content Expert: This is a two semester development commitment. 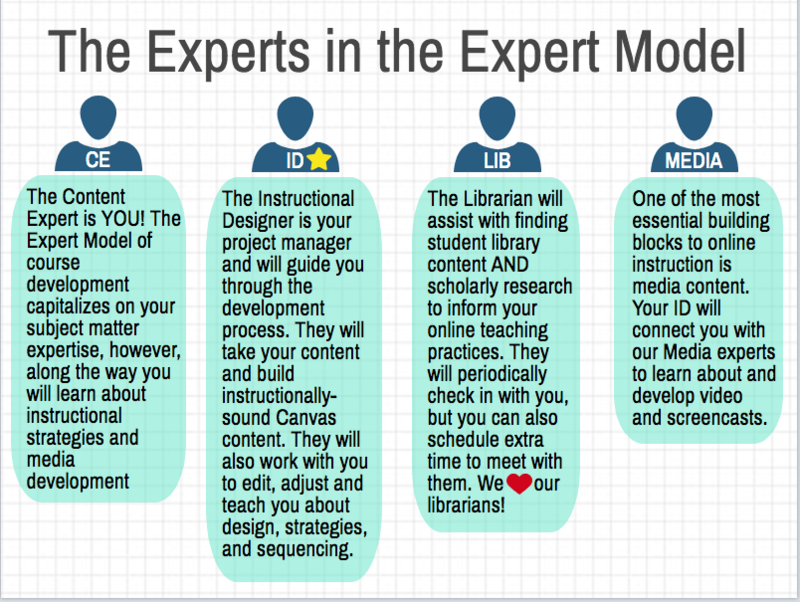 Content Expert faculty will be funded $1500 during the semester of development. The following pilot semester, they will be funded $750 to make revisions to the course. Content Reviewer: In addition to the Content Expert faculty, a Content Reviewer will be funded $750 to peer review the course outline/map and provide feedback on the content of the course. Professional Development: Attend initial kick-off/orientation meeting and if deemed necessary, learn more about OER and project management with Google Drive and Calendar. Later in the development process, faculty will receive personalized training on Cranium Cafe (online office hours and online instruction platform) and Brainfuse (online tutoring). eLearning will fund revisions every 18-24 months for the entire life cycle of the Z Course. 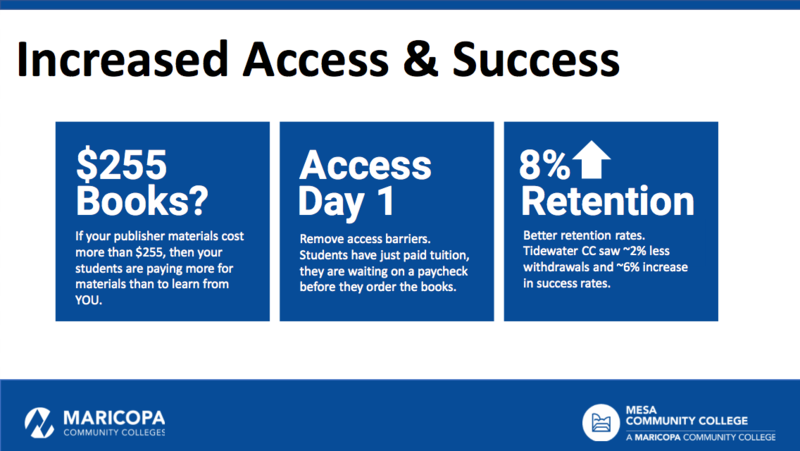 Actual funding amount and revision personnel will vary depending on the need. All Z Degree funded courses will have dual ownership (MCC/Department & Faculty). We will maintain an original copy of the course to maintain the versioning process. Contact Laura Ballard laura.ballard@mesacc.edu, eLearning Director, to be considered for the Z Degree Program. 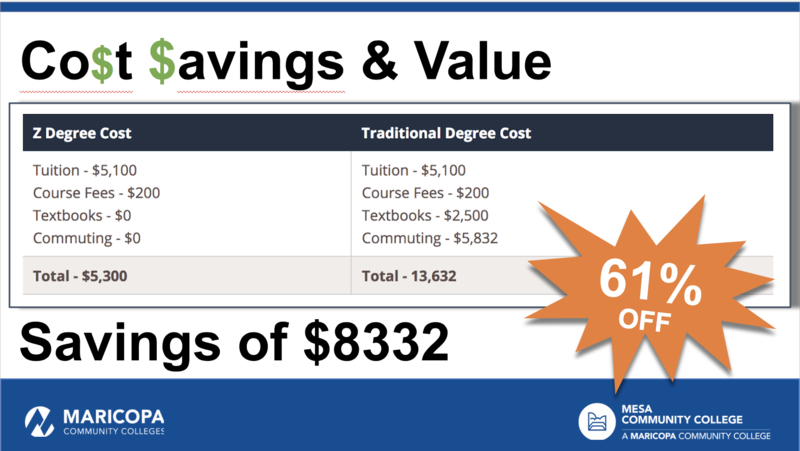 The Zero Textbook Cost Degree at MCC is a result of numerous studies revealing that the rising costs of education impacts student attendance and course selection. Studies show that students make a decision to attend college, select a college major and/or select a class based upon the cost of attendance and the cost of course instructional materials. These studies created a case for the Maricopa Community Colleges to support the Maricopa Millions grant program. The purpose of this grant was to pay faculty to curate and/or develop Open Educational Resources for their courses that would replace expensive textbooks and save students $5 million dollars over 5 years. The Z Degree is MCC’s commitment to provide a more affordable education to our students.